For parents, every milestone reached by their children is a good reason to celebrate. A few of those stand out; the first roll-over, the first steps and eventually, the first word pronounced. All of them represent stepping stones on their way to becoming adults. One that is often overlooked is the cross-crawl. It is often very short in duration due to parents understandably excited to see their little one walk as soon as possible, or it is even being skipped due to lack of tummy time not allowing the child to practice the pattern. The cross-crawl milestone, which usually starts at 8-10 months, is not only beneficial in the child’s physical and neurological development; it will serve her or him much later in life. 1) The torsion created when cross-crawling contributes to increase the tone of the supporting structures of the spine, preparing baby to solidly stand on his two feet later on. It also sets a strong foundation for normal and proper structure and function of the spine as an adolescent and later as an adult. 2) Activities such as walking, running, talking, dancing or even taking notes while listening to the professor are made possible because of both sides of the brain communication with one another. Cross-crawl develops and sharpens the neural pathways between the two hemispheres of the brain responsible for the accomplishment of all complex tasks. 3) The cerebellum is also involved. The increased “little brain” activity during cross-crawl, on top of the stimulation to the high-order thinking function of the frontal cortex, contributes to better balance and coordination, which becomes particularly important when kiddo starts to walk and develops an interest in sports. 4) Sensitivity of the palms and hands is heightened as baby crawls forward and explores the different surfaces and textures around him. The lays the groundwork to accomplishing tasks that require a higher level of body awareness and precision such as picking up small objects, writing and playing a musical instrument. 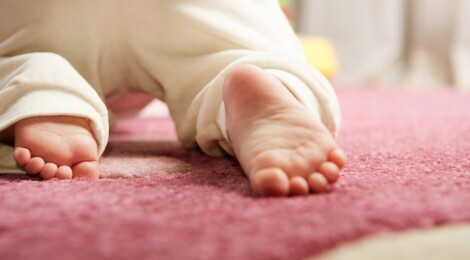 5) On the visual aspect, crawling allows the child to develop a sense of distances, sizes and volumes of objects. For example, this cognitive measuring of the world lets baby know the distance between her and mommy, or if the sofa is closer to her than her favorite toy. In the future, this skill is translated to solving puzzles, fitting a particularly-shaped object into a tight space and even dancing or being the best at obstacle courses in gym class. Getting on all fours is a great way to bond with your child and allow you to also sharpen the same cross-crawling skills that are so useful to her. It will directly improve your balance and coordination as you chase her around through tunnels and tents made with her favorite blankets. Based on all the benefits, it will make them stronger as they start walking and also be more efficient as they grow up. Drs. Genevieve and Jean-Philippe Mercier are owners of Premier Chiropractic in Emmaus, Pennsylvania. Premier Chiropractic focuses on Neuro-Spinal Correction, serving families in the Lehigh Valley and surrounding areas. Over 75% of the practice is for pediatric or prenatal/postnatal care, where families receive specific care in regards to their Neuro-Spinal system. You may contact their office at premierchiropa@gmail.com.